Cole Phillips was born in Springfield, Ohio, into a lower middle class family. His parents had few aspirations for him, however, he drew throughout his childhood. His first job was at the American Radiator Company where he worked as a clerk. In 1902 he began attending Kenyon College, where he created popular illustrations for the school yearbook and magazine, The Reveille. In his junior year, Phillips left school and headed to New York City, with hopes of making it as an artist. Of course, career plans rarely follow a linear path, and he had his fair share of ups and downs. Immediately, he was hired at the American Radiator Company’s NYC branch. He was fired however, since he drew on the job, and was found with an unflattering caricature of his boss. Next, he got a job working in what was effectively an art assembly line. Here, he would often draw just ankles, a skill that would come in surprisingly handy when he began working closely with hosiery companies Holeproof and Luxite. He quit this tedious job after only eight weeks and after a brief stint at an advertising agency, figured he could open his own. He did, but found that he had no time to paint or do any of his own work, so became a freelance illustrator, relying only on a month’s worth of savings. He was able to secure a job at the magazine Life (a different one than the one you’re probably thinking of) and began doing illustrations for them. His big breakthrough came when he was assigned his first cover. He decided to utilize a technique he’d been thinking about, where he removed strategic parts of the foreground and bled the background color through that space, effectively using negative space to “draw” large parts of the illustration. The cover was a huge success and was dubbed the first “Fade away girl.” Phillips’ new fade away technique would become a signature of his. 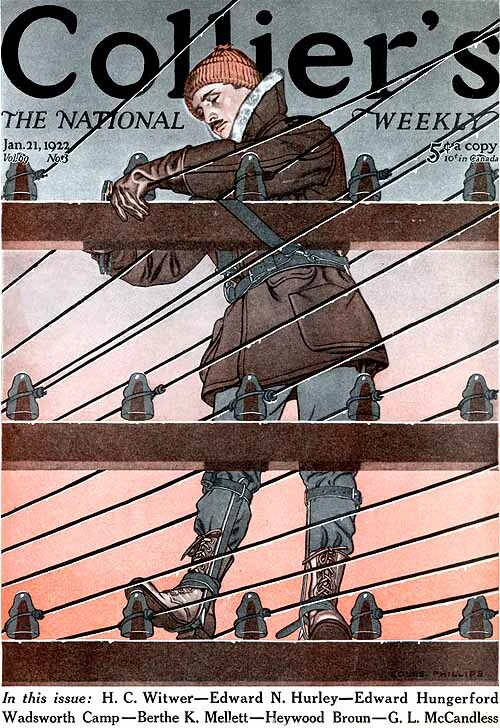 Over the course of his career, Phillips would illustrate over 50 covers for Life. He also signed a five year, monthly cover contract with Good Housekeeping. 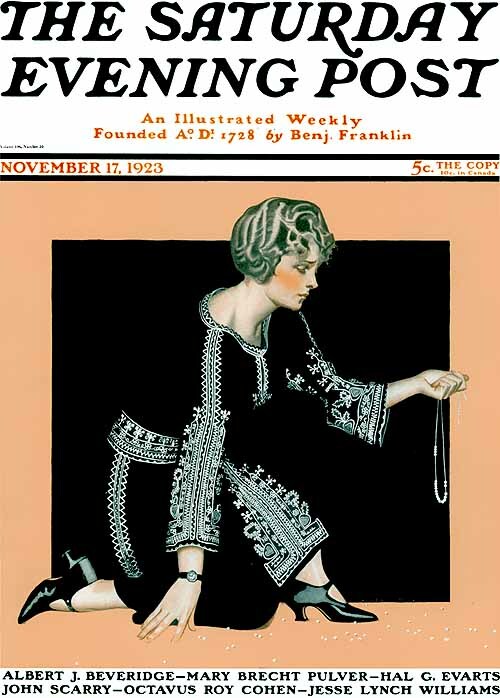 He illustrated numerous books, advertisements, as well as magazine covers for Colliers, Ladies’ Home Journal, McCall’s, Saturday Evening Post, Women’s Home Companion, and Liberty. Oftentimes, he wrote his own copy for his advertisements. Phillips’ work became increasingly more sexual over time, as society loosened. Even still, many of his illustrations were of beautiful women, and caused quite a stir. He is even credited with drawing the first pin up girl. His use of strong design principles helped his work gain mass appeal, and was famous throughout the world. 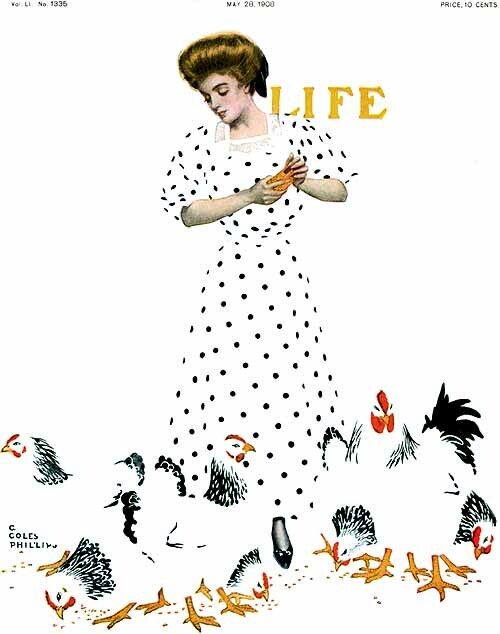 From 1907 – 1927 he was considered one of the most popular American illustrators. Sadly for him, his fade away work was so well liked that art directors often didn’t let him experiment outside of those bounds. Phillips was a businessman about all his illustration endeavours, and insisted that he include his signature on all his works. He died from kidney disease at the age of 47.